In years 7, 8 and 9 the aim is to provide a progressive programme of physical education aimed at developing the full potential of each individual. To provide opportunity for students to develop skills by participating in participate in sport/physical activity and to develop physical skills and techniques that are specific to each sport undertaken. The department encourages students to strive and work towards their own targets in all aspects of PE at their own level and pace. They are encouraged to adopt positive attitudes towards exercise and healthy lifestyles. Athletics, Badminton, Basketball, Football, Netball, Cricket, Rounders, Tennis, Trampolining, Health Related Fitness, Volleyball, Table Tennis, Softball. 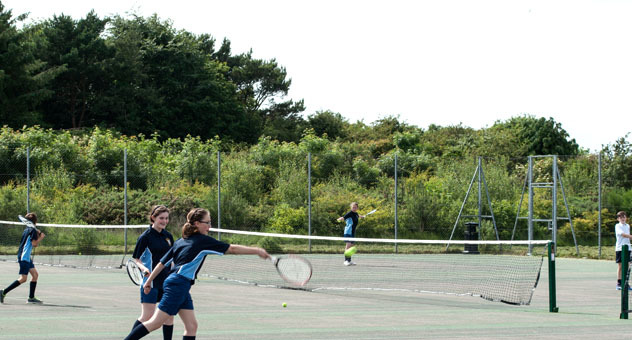 We encourage all students to take part in a variety of extra-curricular sporting clubs that the department offers in order to further develop the skills learnt in lessons. Homework tasks may also be set to extend and assess students’ knowledge of sport and physical education. It is essential that students have the correct PE Uniform with them for each lesson. To provide the opportunity for students to follow their preferred sporting pathway to achieve accreditation in one of the following courses— Sports Leaders Award, BTEC SPORT or GCSE PE. Sports Leaders – Some students will have the opportunity to gain a Level 1 Sports Leaders Award. This provides the ideal starting point for those who wish to develop their leadership skills. The specification is designed to develop generic leadership skills that can be applied to a variety of sports and/or recreational situations as well as contributing to the personal development of the student. BTEC Sport—Provides the opportunity for students to develop their knowledge and understanding of sport in depth. Students will complete assignments throughout the 2 years based on different units studied. GCSE PE – Students develop their knowledge, skills and understanding of sport in depth. Students complete a theory exam at the end of the year and are continually assessed on their practical ability. CORE PE—Continuing on sports covered in Key Stage 3 – Athletics, Badminton, Basketball, Football, Netball, Cricket, Rounders, Tennis, Trampolining, Health Related Fitness, Volleyball, Table Tennis, Softball. Play as much sport in and out of school as much as possible to improve practical ability. Assignment based tasks plus exam style questions for the exam part of the course. For more information about the PE curriculum please contact Mrs Dempsey.